Find flooring that features the perfect balance of functionality and appeal. 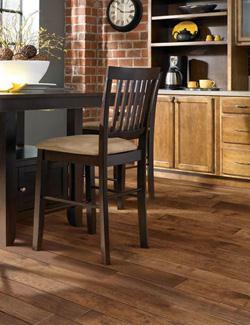 Our selection of products includes vinyl planks that are both scratch and spill resistant. When you decide to redecorate your home, visit Cloister Flooring America and start a conversation with a design specialist that takes the time to listen. Our selection of luxury vinyl planks in Ephrata, PA, is hard to match. We separate ourselves from other flooring stores with our combination of attentive design assistance and installation by skilled professionals. You deserve a new floor that looks great well into the future. Every customer that we serve has differing needs, so we give each the latitude they need with price protection guarantees and installation warranties. Our 5-Star Selection System allows the customer to find flooring that fits the décor of every room in their home or business. While vinyl tiles crafted to match the appearance of stone go great in places like the upstairs bathroom, many appreciate the traditional presence of vinyl planks designed to look like various species of wood. Identifying the right type of flooring for each room requires training, experience, and product knowledge. We are ready to match any room with the right planks. Our designers consider your entire home when suggesting a vinyl product for a particular room. Your existing home may have plain floors that have faded and warped over time. Choosing the right flooring type for each room can prove difficult without our level of experience. While hardwood flooring is an excellent option for the ground floor, finished basements and bathrooms on the upper floors need resilient flooring that hides subfloor imperfections. When you choose an experienced installation contractor, your luxury vinyl plank floor will be able to resist spills without issue. Luxury vinyl planks (LVP) are available in a number of styles and textures, so you can find a product that matches the existing wood from other rooms. Our selection gives you a broader degree of flexibility when it comes to decorating upper floors. Give your existing home a new lease on life when you select the right group for luxury vinyl plank floor installation. Vinyl planks won’t expand and contract to the degree that wood does when exposed to moisture, so there is no need for expansion joints. You won’t be derailed by subfloor imperfections either when you decorate with vinyl plank. Depending on the condition of your subfloor, your installation can be completed sooner than you imagined. Start decorating your home from the floor up with an LVP floor, and save time and money along the way. Contact us to learn more about the unique appeal that comes with luxury vinyl planks. We proudly serve customers in Ephrata, Denver, Akron, Brickerville, Adamstown, Pennsylvania, and the surrounding communities.